plain fat and determinedly so. exercise and decrease caloric intake. 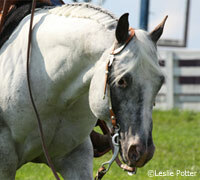 shorter rides per week are better for your horse than one long ride a week. of two parts: concentrate and roughage. third of a cup, if any at all. a grazing muzzle when he’s out. prone to a handful of equine-specific problems. such as ligaments and tendons) can be made worse by carrying extra weight. horse on a diet is much easier than combating these problems in the future. Very good information here. Thanks for the tips!! I have a girl that I will start using some of these tips. Thanks!! Excellent article on obesity in horses. I have a 20 year old Norweigan Fjhordhorse. She has not had grain since the age of 2 years. She lives on a poor pasture plus 1 flake of hay twice a day in the winter. I am atempting to increase her exercise to 5 days per week. Thank-you for tips that will help her live a long healthy life. Very good article. I have been congratulated on having the only overweight thoroughbred in the world! However, she does not have a crest or ‘apple bottom’ – her only problem is a big grass belly. She comes in overnight but of course I am guilty of feeding her and giving her treats. She has been out of work a lot this year due to firstly a check tendon injury which took 4 months to heal and she secondly then got hit by a car (but thank God she survived it). I will try to exercise more and hope that the winter helps to cut down on the big belly! She is only 15 so I hope she has many years left yet. Great article. It always amazes me how many horse people think that grain is necessary. We just got a teenage horse who has eaten grain all his life. Since he is used to this “treat” every morning we gradually switched him over to a handful of alfalfa pellets instead. He loves them and they’re so much healthier! Good reading and it makes alot of sense. It is just as hard for animals to loose weight as people. Less calories and more excerise.